With a wedding to pay for next year, engaged couple Delvon and Will have been saving money by living in their 300-square-foot studio in the Bronx. But sharing such a small space has been proving to be a true test of their organizational skills as well as their relationship. Tired of being surrounded by clutter, the pair called upon the IKEA Home Tour crew to retool their cramped quarters into a simplified and serene space. Read on to see the "before" and "after" pics and a video of IKEA's storage-maximizing makeover. Will and Delvon faced some common challenges in their 300-square-foot studio apartment. The couple already had a Brimnes bed with four built-in drawers but was still in need of more clothing storage. Because of the limited floor space in the apartment, the IKEA team decided to use the ample and available wall space to add much-needed storage. The team also added lots of shoe storage to house the couple’s large collection of footwear, and new cabinets flanking the bed solve Will and Delvon’s wardrobe woes. And in the dining/study area, a sleek and simple foldable table does double duty as a desk while books are stored on shelves above. “This space is definitely going to allow us to stay here longer because our main goal was to save up money for the wedding next year. So the wait in this space is totally doable,” said Delvon of his revamped home. If you enjoyed this makeover, check out more of IKEA’s Home Tour series here and more small living inspiration here. Delvon welcoming the IKEA Home Tour team into the small studio he shares with his fiance Will. 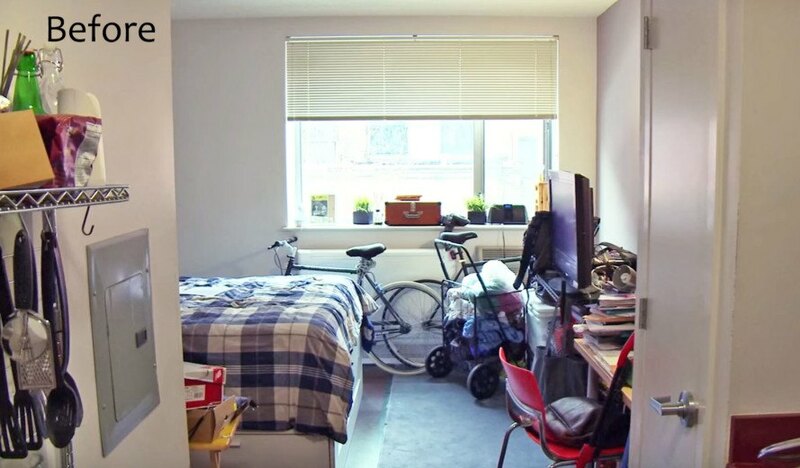 With one room basically serving as their living area, bedroom, kitchen, study space and closet, not an inch can be spared. The couple already had a Brimnes bed with four built-in drawers but was still in need of more clothing storage space. "With a wedding coming up, you know, moving right now just isn't in that cards for us," Delvon said. "We're really challenged with organization. If you look around you see we have things scattered just scattered everywhere. We just want this stuff to just disappear." The IKEA team getting to work. Because of the limited floor space in the apartment, the IKEA team decided to use the ample and available wall space to add much-needed storage. "Delvon and Will have such a small space we don't want to clutter up their floor with big storage," said IKEA Home Tour team member Brooke. "If you've got wall space and you're not using it, installing shelves is a great, fast easy and inexpensive way to add a lot of storage without impacting your floor space." The team also added lots of shoe storage to house the couple's large collection of footwear. New cabinets flanking the bed solve Will and Delvon's wardrobe woes. A new mini countertop creates a work surface with room for bike storage below. A sleek and simple table does double duty as a desk while books are stored on shelves above. The versatile table flips out when it's time to eat. "This space is definitely going to allow us to stay here longer because our main goal was to save up money for the wedding next year. So the wait in this space is totally doable," said Delvon of his revamped home. If you enjoyed this makeover, check out more of IKEA's Home Tour series here and more small living inspiration here.